Prime eyelids and apply MAC Soft Brown as a base shade all over the lids (1). I have darker lids and this color helps neutralize the discoloration and creates a blank canvas of sorts for other colors to go on. Apply MAC Brown Script as a sheer wash all over lids and blend along the socket line (2). This will add a warm base over the lids and work as a transition for the purple ehyeshadow along the crease/socket line. Use Urban Decay eyeliner in Rockstar along the lashline (3). A smudgey kohl liner would work better as the UD pencils are a bit difficult to smudge, but it's what I had on hand. I used a purple-based liner rather than black since I didn't want too much darkness along the lashline. You could also use a brown shade. Smudge the eyeliner along the lashline (4). I have kept the color thinner toward the inner corner of the eye and smudged it into a broader shape toward the outer corner. 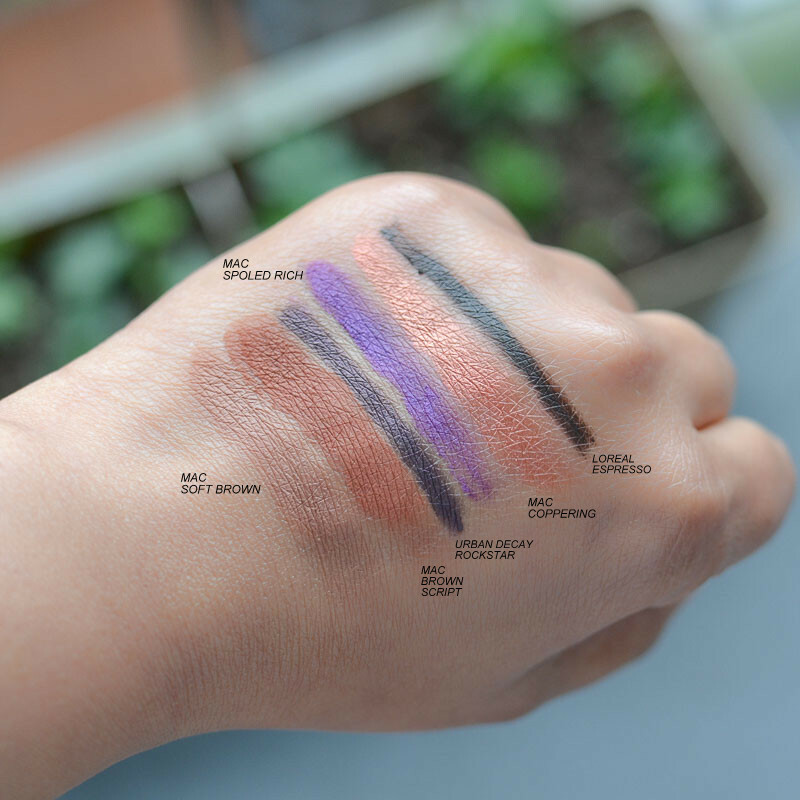 Apply a purple eyeshadow (I have used MAC Spoiled Rich) along the lashline and over the smudged eyeliner (5), using a flat shadow brush to place the eyeshadow. I have followed the same shape as the liner, placing more shadow along the outer corner and less along the inner. Using a clean blending brush, blend along the edges of the eyeshadow, buffing in small circles and pulling the color upwards. As you blend and buff along the edges (not on the eyeshadow itself), the color will start to fade upwards. I repeated the two steps (5) and (6) - applying eyeshadow and blending it - a couple of times to build up the color to the desired intensity. It gives me better control than just plopping a lot of shadow along whole lid and trying to blend it. 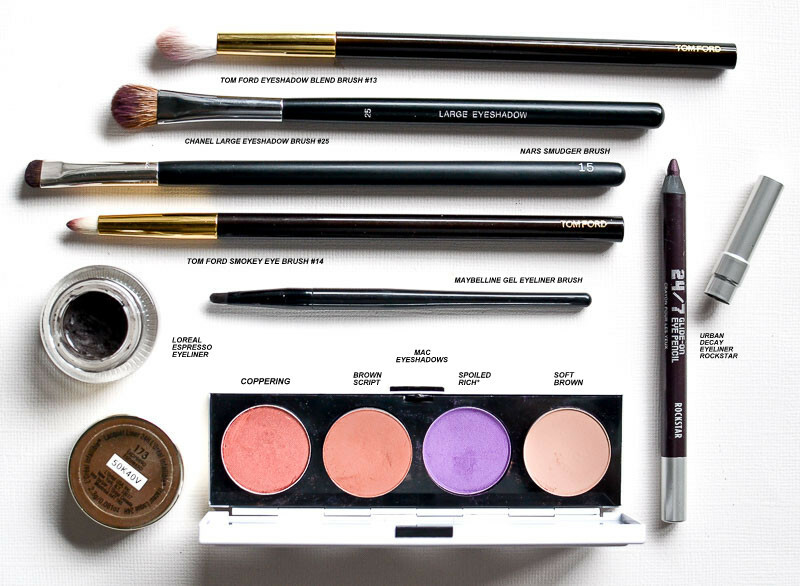 Using a pointed smudger brush, apply MAC Coppering along the inner corner of the eye and blend the shadow into the purple (7). Tightline and line the lower waterline. 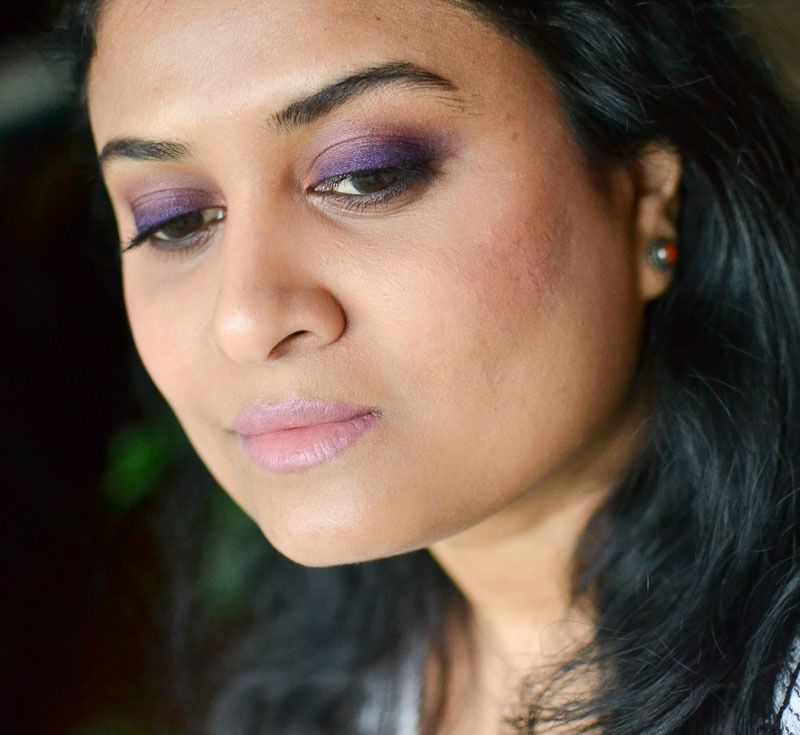 Smudge along the lower lashline using the same purple shadow applied over lid (8). 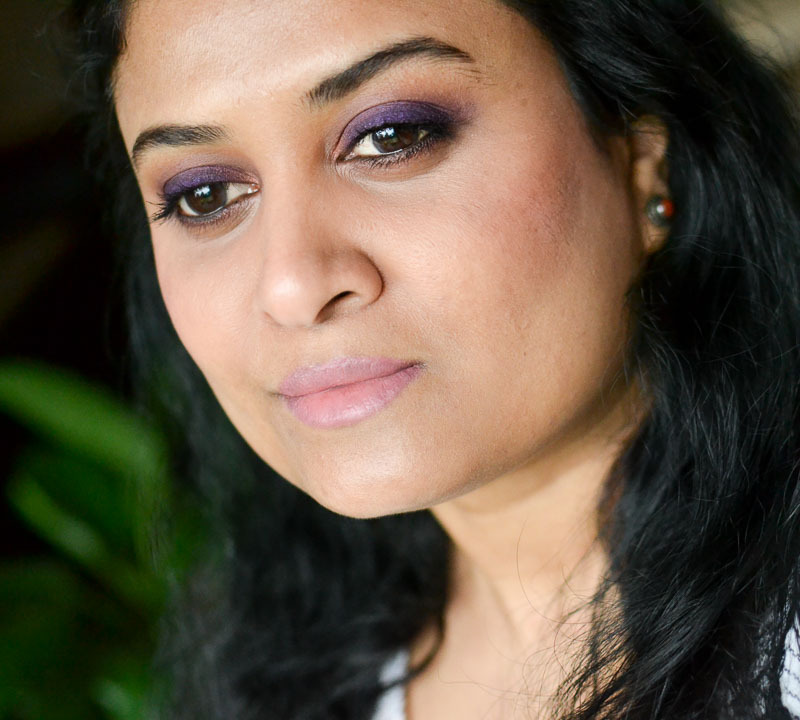 Use MAC Brown Script to blend the purple eyeshadow that was applied in previous step along the lower lashline (9). You can extend the color all the way to the inner corner of the eye. I was having quite watery itchy eyes and I didn't. Finish with curled lashes and mascara. I decided to the balance the purple eye makeup with a softer lip color and opted for Urban Decay Vice lipstick in Backtalk (UD comfort mattes are the best if you tend to have dry lips like I do). For the cheeks, I used NARS blush in Goulue and a bit of Smashbox LA Lights blendable cheek-lip color in Venice Beach Bronze. 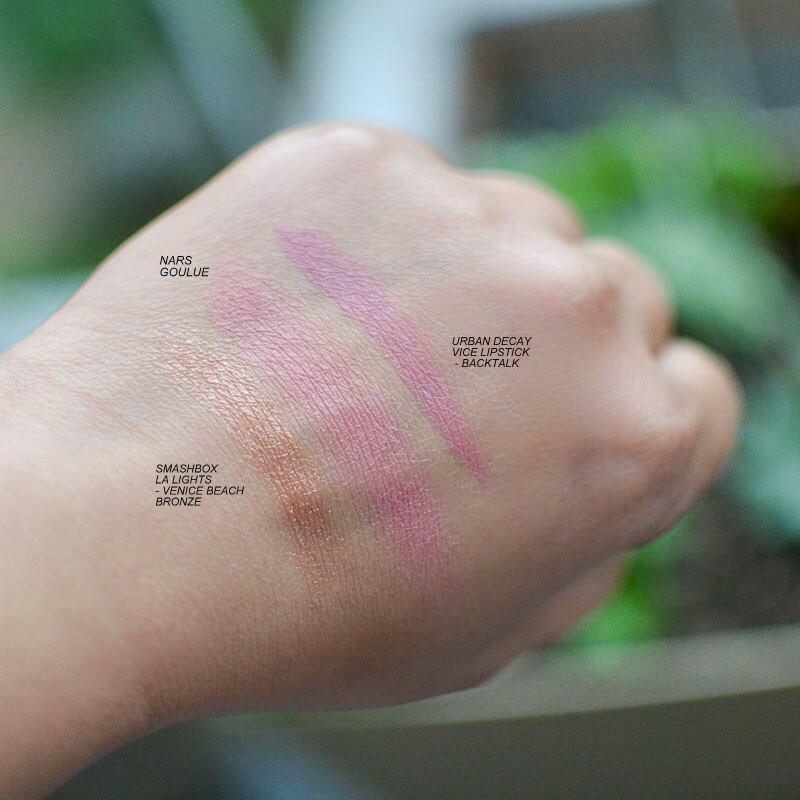 Swatches below. 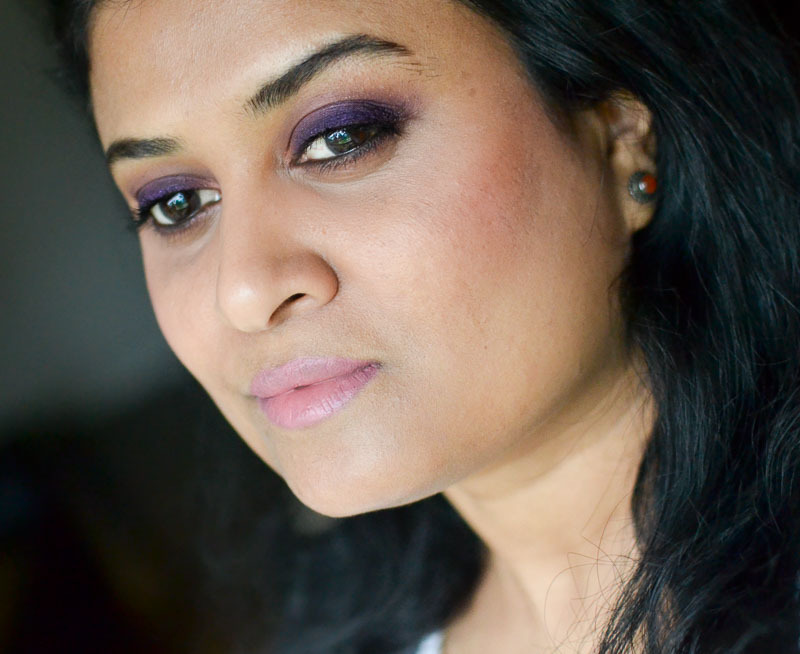 If you have been shy of purple eyeshadows, give this makeup look a try. 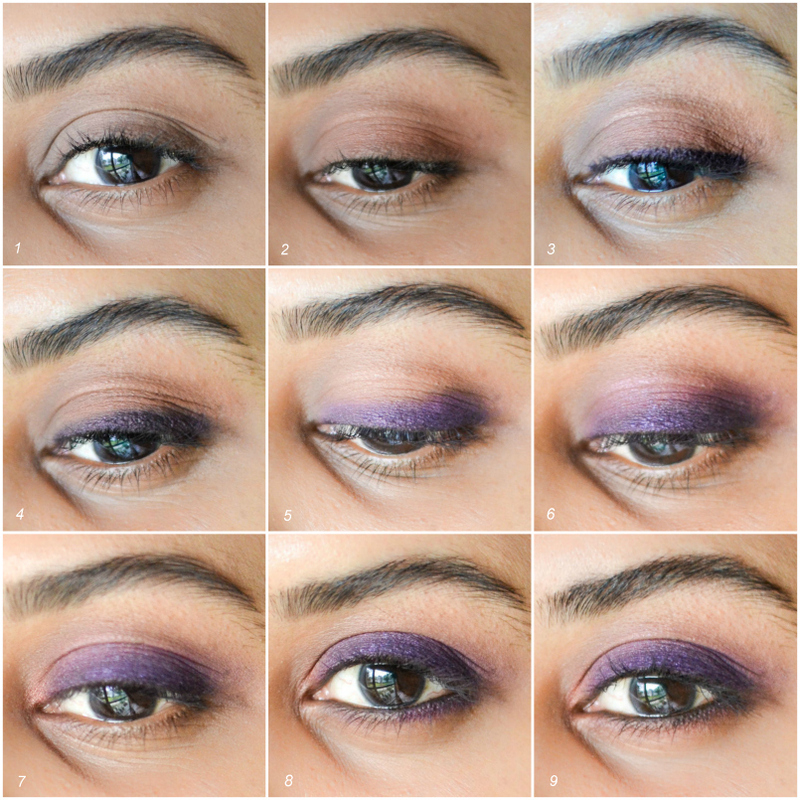 It's easy, and you can control how intense you want the purple eyeshadow to be and/or how much time you want to spend blending and buffing the color.